There was a time when taking a deep soak, lighting a candle and turning on some tunes didn't seem like such a big deal. That time, for most of us, was before children. Now, if you're anything like me, a long bath is something that takes place during a work trip when I'm away from the house. That is when I don't feel any guilt for taking up space in the bathroom to just BE. It often feels like luxury to just sit and relax. The Long Beach ladies behind Muse Bath want to take that limiting notion and flip it on it's head. 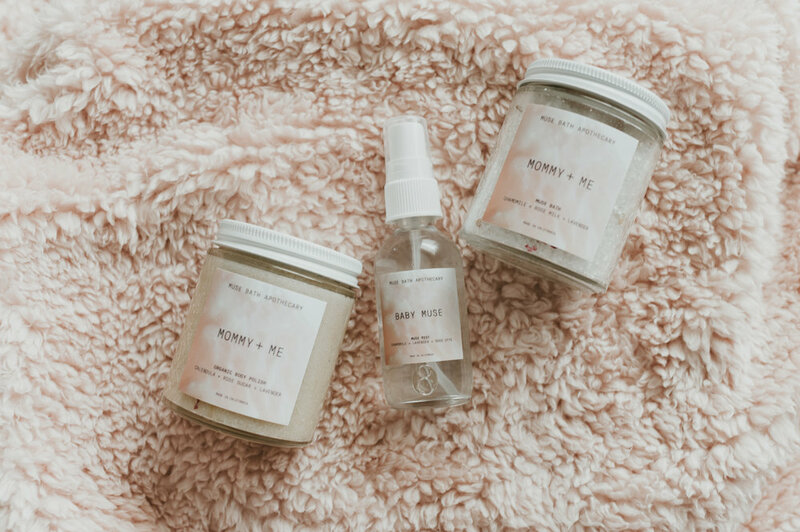 Kristen Flores, founder of Muse Bath and Bon Muse Media shared the story behind their magical and deliciously smelling botanical product line. What is your advice for busy Mothers who work-full time either inside or outside of the home? Is there a single self-care act or set of practices you would recommend to these women? Motherhood is a full-time job and balancing one's self-care can be quite the juggling act. One of the best ways to teach your family about the importance of self-care is creating a special time and space where you can connect to your self-care rituals. Demonstrating to your kids that Mommy has a special time everyday to meditate, bathe, and/or take quiet time teaches kids to respect the boundaries of slowing down a bit each day. I love to use my Intentional Mist line to use aromatherapy for calming down my environments when the day seems hectic. I have also made a little sign to hang on my bedroom door knob that reads "Special Time" for when I meditate, journal, listen to calming music, etc. For 5 to 20 minutes each day, I give myself a little bit of personal time. My loved ones know that when I go into my special time, I come out much more relaxed. How do you select the botanical ingredients for each of your products? All of my botanicals, minerals, essential oils and ingredients are specifically selected for their quality and healing properties. I love the art of crafting organic and luxurious beauty rituals to celebrate the soul. Each blend has an intention to nurture one's self-care rituals and promote inner beauty. What inspired you to create the Mommy & Me product line? I wanted to create an intentional line that nurtured Mothers and Mothers-to Be and celebrate their beauty rituals with their little ones, too. I wanted bathing products that celebrated the Motherhood experience as a beautiful connection to self-love and self-care. We are THRILLED to be working with Muse Bath for this week's #GratitudeGiveaway. One lucky winner will receive the Mommy & Me Body Polish and the Mommy & Me Muse Bath. Check out our Facebook and Instagram pages for further details!